As many of you will know, last month Rebecca Jackrel sadly passed away. 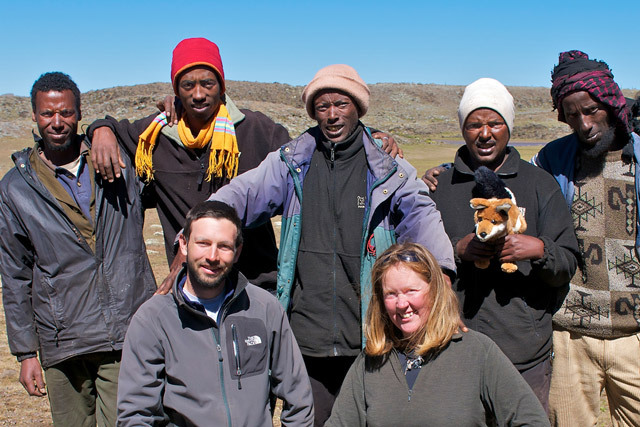 Rebecca was the driving force behind the Ethiopian Wolf Project. She first visited Ethiopia in February 2011 and fell in love with the wolves and their fragile high-altitude habitat. On returning home, she set about planning an ambitious documentary project with the ultimate aim of raising awareness and funds for the Ethiopian Wolf Conservation Program (EWCP). At this point, she invited me to be a part of the project, something that I will always be grateful to her for. After successfully raising funds for the project through Kickstarter, we travelled to Ethiopia in November 2011 to spend 5 weeks documenting the lives of the wolves and their struggle for survival. It was during this time that I really got to know Rebecca, and see on a daily basis what a fun, generous and caring person she was. Her personality shines through in her blog posts from the period. After the expedition, she worked tirelessly to follow through with the aims of the project. Gallery exhibits, magazine articles and talks helped raise awareness for the plight of the wolves. She also managed the production of our beautiful coffee table book in collaboration with Jaymi Heimbuch. Copies of the book were donated to the EWCP to help with their awareness initiatives and a significant portion of the profits from book sales were also donated to them. Shortly after the book came out, Rebecca was diagnosed with cancer and her two-year battle with the disease commenced — a battle that she was to fight with inspirational courage and strength. Right up until the end, she continued to commit her energy to advocating for the wolves. 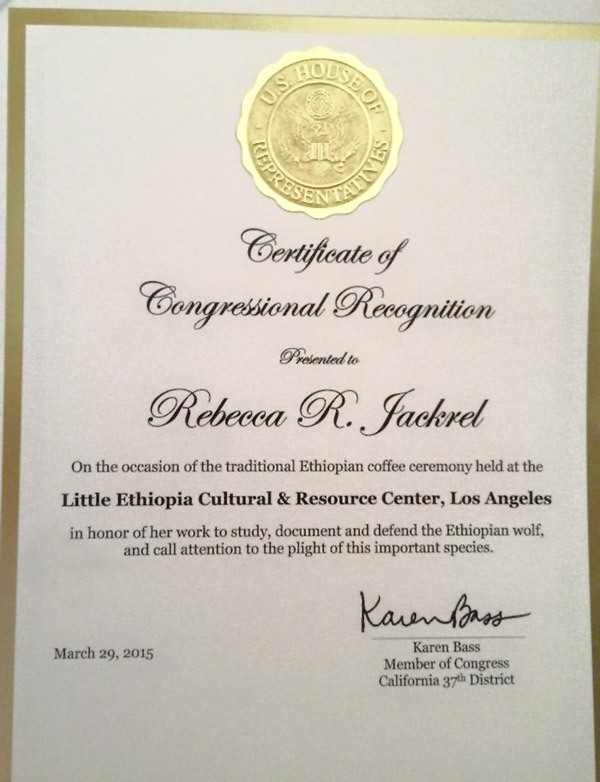 One of her final achievements was being awarded a Certificate of Congressional Recognition in honour of her work. People as generous as Rebecca are very rare. It was a privilege to work with her on this project and I feel honoured to have been able to call her a friend. I miss her greatly. Thank you for including me in this very sad announcement. As I posted on Facebook, I feel very privileged to have known her, even for a short time. She was an uplifting, considerate and gifted individual and an example to us all. A beautiful tribute to my beautiful daughter on her birthday!She is so terribly missed!